Pancakes are an American classic. Breakfast and brunch would simply be incomplete without them piled high and served with syrup, butter, and all of your topping favorites. While the pancake has been a part of your mornings for as long as you can remember, it also dates back thousands of years! 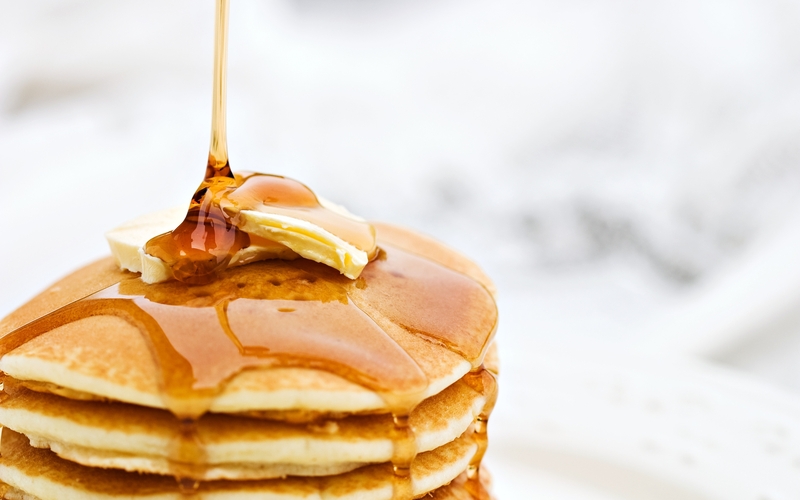 Explore the history and traditions behind your favorite breakfast food, the pancake! Pancakes have been around for centuries as a favorite staple in many cultures’ diets. They began over 30,000 years ago during the Stone Age. Researchers have found pancakes in the stomach of Otzi the Iceman, human remains dating back 5,300 years. In ancient Greece and Rome, pancakes were made from wheat flour, olive oil, honey, and curdled milk. Ancient Greek poets, Cratinus and Magnes wrote about pancakes in their poetry. Shakespeare even mentions them in his famous plays. During the English Renaissance pancakes were flavored with spices, rosewater, sherry, and apples. The name “pancake” started during the 15th century but became standard in 19th century America. Perviously, they were called indian cakes, hoe cakes, johnnycakes, journey cakes, buckwheat cakes, buckwheats, griddle cakes, and flapjacks. Early American pancakes were made with buckwheat or cornmeal. Thomas Jefferson loved them so much he sent a special recipe to his home town from the White House. Yup, you heard us—Pancake Day is real! Shrove Tuesday(Fat Tuesday) is the holiday of feasting before Lent. During Lent, people were once not allowed to eat animal products like milk, butter, and eggs. To prevent them from going to waste these ingredients were cooked into tall stacks of pancakes. They were consumed in such large amounts that this day earned the rightful name of Pancake Day. You may be surprised to find that pancakes exist all over the world and it seems that each culture has its own unique take on them. They are served for breakfast, lunch, and dinner all over the globe. A few examples of this transcultural food are: Crepes, potato latkes, Irish boxty, Russian blini, Welsh crampog, Indian poori, Hungarian palacsinta, and Dutch pannenkoeken. Everyone here at Kate’s Kitchen is suffering from pancake syndrome, which we define as the love, addiction, and obsession with pancakes! But it turns out that "pancake syndrome" is actually a medical condition. It occurs in tropical regions when the flour used in pancakes has been contaminated my mites and causes consumers to have an allergic reaction. YIKES! Pancakes come in many different shapes, sizes and flavors. They can be sweet, savory, thick, thin, small or large, but they are all delicious! While there are many types of pancakes, at Kate’s Kitchen we like to keep it classic with the traditional American style. You can your have your choice of Banana, Craisin+Granola, Blueberry, Apple+Pecan or Cinnamon+Roasted Pecan served fresh off the griddle with butter and maple syrup. YUM! Pancakes really have stood the test of time with their extensive history all over the world. They hold a special place in our hearts, reminding us of comfort, family meals, and Saturday mornings. And as it happens, this weekend is the perfect time to celebrate this beloved food AND the beloved men in our lives. Celebrate Dad this Father’s Day with a tall stack of homemade pancakes at Kate’s Kitchen! Celebrate Mom With Mother’s Day Brunch!